Students received valuable career advice and practiced their interviewing skills at ChemE Day on Tuesday, Feb. 5. The department’s annual career and resume workshop and networking event drew 11 industry partners and over 150 students. A big thank you to our industrial partners: Argos USA, CDM Smith, ExxonMobil, Kraton, Mosaic, Oak Ridge National Laboratory, Packaging Corporation of America, PepsiCo, Syngenta, Texas Instruments, and WestRock, and to our Chemical Engineering Peer Advisors (ChEPAs) and the American Institute of Chemical Engineers (AIChE) volunteers. 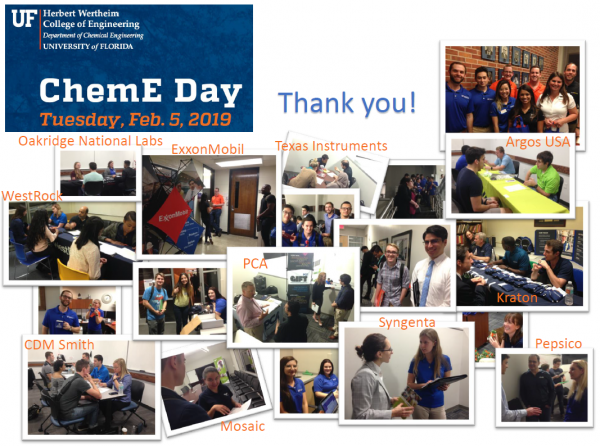 Together, you helped to make ChemE Day a success!